with a heat-insulating EPP-housing and with large air filter integrated, suitable for single- to four-family houses and for air quantities of 100 to 350 cbm/h . 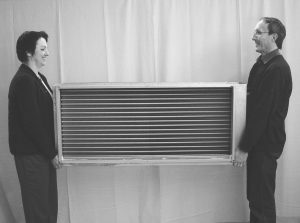 Air filter with double layer (G4 + F7), large surface (2,9 m²) and small air pressure drop. Tubular air pipe connections 160mm and 180 mm, expandible up to 250 mm. 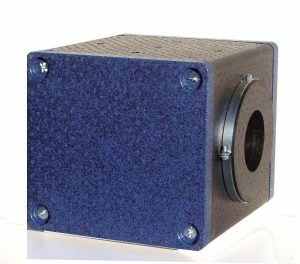 with non-heat-insulated metal housing and without integrated air filter, suitable for single- to five-family houses and for air quantities of 100 to 400 cbm/h. 3 Models designed for 200, 250 and 400 cbm/h with tubular air pipe connections of 200, 250, 315 and 400 mm. in different sizes for air volumes 500-12.000 m³/h. Foto shows a model for 2.500 m³/h. 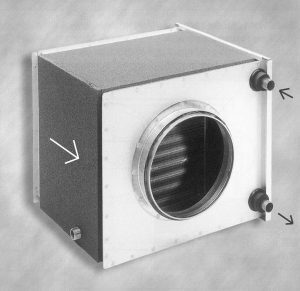 Non-heat-insulated metal housing and without integrated air filter. With rectangular air channels up t0 maximal 1,3 *2,5 m size.